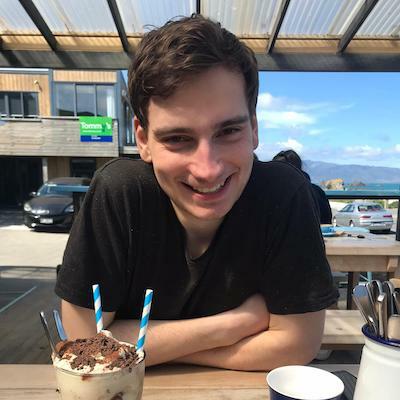 In November of last year I finished my Software Engineering degree and moved to Wellington to start work at Flux Federation. Flux builds software that runs energy companies like Powershop - an energy retailer in New Zealand, Australia and the United Kingdom. I work as part of the team that builds the Rails app that brings the power to the people. My first few months were spent in training on what Flux calls the Dev Train. I had never done anything with Ruby before, so it started with building a command line game of Hangman in Ruby, followed by a Rails version. My first Ruby program, command line Hangman! While building these myself and the other Dev Trainees had code review sessions with Dev Train mentors. These sessions taught us how to best design software systems and write clean, maintainable code. Next, I made a Rails version of the Ticket to Ride boardgame. I approached this using test driven development (TDD). This basically means you write some tests for new features, then write the code that makes the tests pass, then refactor the code and tests. For me, one of the biggest take aways of the Dev Train was that testing is important! Yes, tests can take a lot of time to write, but especially in a large, complex codebase they become absolutely essential to ensure everything is still ticking along as it should. For Ticket to Ride I wrote unit tests in RSpec and integration tests with Cucumber. RSpec allowed me to test the public methods in my controllers, models and services. I found the ability to mock out dependant services incredibly useful. This ensures your specs are only concerned with the code under test, rather than all it’s dependencies. Mocking means that rather than spending time setting up situations where a depdendant service will return a particular result, you can just mock it to return a particular result and make assertions about how the code under test should respond. For example, I have a ClaimRouteController which calls a ClaimRoute service. In my specs for ClaimRouteController I mock out ClaimRoute and assert that when ClaimRoute returns errors that these errors will be added to the flash to be displayed to the user. This means I don’t have to do the work of setting up a situation where ClaimRoute will fail when all I care about is that the controller handles errors appropriately. Cucumber allows you to automate the process of a user testing out all the features of your application in a browser. A Cucumber feature consists of a series of steps to run the test. A Cucumber feature is pretty easy to read. For example, as below, the Claim Route feature sets up a game with some train pieces and train cars, then proceeds through the steps to claim a route between two cities. This feature is successful if after doing this the list of routes shows this route as being claimed by the player. Each of these steps has a corresponding step definiton. Step definitions are the code behind the scenarios that executes the step. You can use regular expressions in the names of steps to pass parameters to step definitions, keeping steps sounding natural and reusable. Spend train cars and train pieces to claim a route. Either way, you can checkout the code on GitHub and some screenshots of the app below. I’m now finished the Dev Train and onto ‘real work’ now, but that doesn’t mean the learning stops! With the tech industry moving so fast there is always something new to learn. Flux has an awesome learning culture; each week a few members of the crew give a talk about something that interests them, and 10% of our time goes towards learning new things with Hackdays projects. I’m really enjoying my time at Flux and I’m looking forward to seeing what’s in store for the next few years! Edit, 29 Oct 2017: The software dev arm of Powershop split out into a company called Flux Federation a few months ago. It’s still the same awesome place to work so I’ve replaced references to Powershop with Flux.